Penrith Harmony - Book Us! If you have a group, club, organisation, or association and you're looking for good, wholesome entertainment, please consider Penrith Harmony. You can hire us to perform at your event, be it a community lunch, concert, family celebration, seminar, wedding or other occasion. From our repertoire of ballads, up-tunes, old songs, love songs and Australiana, from The Beach Boys to Billy Joel, the wonderful old screen musicals, from crooners to comedians and foot tappers to tear-jerkers, we can build a great program for your event. We can provide small or large groups of singers and we especially cater for seasonal events such as Christmas and Mothers Day. Our music is suitable for all sorts of occasions including small or large private or corporate parties or dinners, boardroom events, product launches, official openings, fairs and festivals, sporting events, conferences, seminars and many other special occasions. 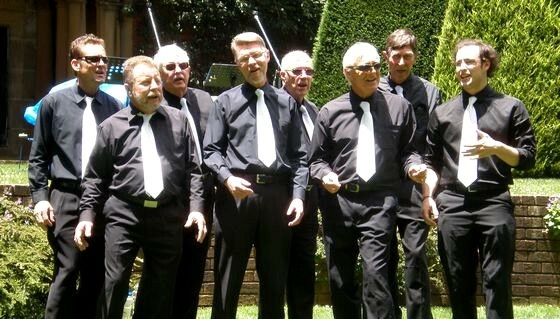 We perform for charities, hospitals, local councils and aged care groups, as well as appearing as part of other groups’ programs. We also produce our own concerts to which you are cordially invited. We’d love to sing for you, so please contact our bookings officer to find out more about our performances.